While ISPs often advertise ADSL2+ and ADSL services as having maximum downlink connection speeds of 24 Mbps and 8 Mbps, respectively, very few broadband users can expect to achieve such speeds. As shown in the figure below, a broadband signal generally has to travel considerable distances along the copper cable from the exchange to the street cabinet (the so-called 'E-side'), and then along another cable from the street cabinet to the nearby residential and business premises (the so-called 'D-side'). The broadband signal from the exchange suffers attenuation (loss) as it travels along the cable from the exchange to your broadband modem, reducing the speeds that can be delivered. In general, the longer the total distance between your modem and the exchange, the more that signals are attenuated, as shown in the chart below. ADSL2+ provides most benefit for premises close to the exchange. 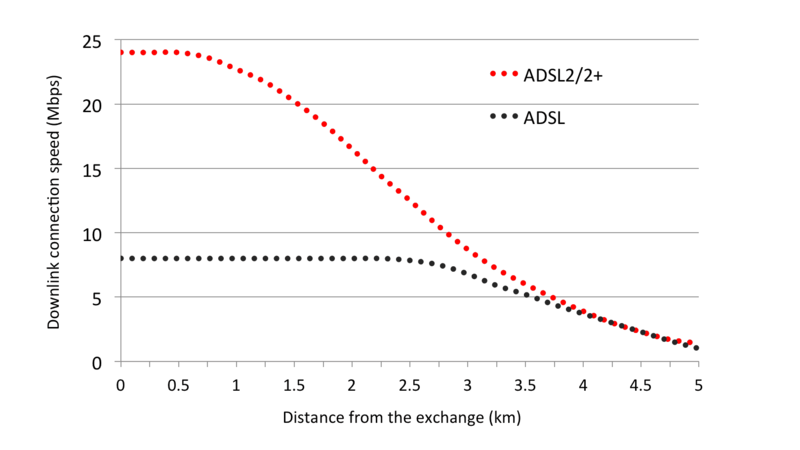 For distances between 3 km and 3.5 km, where ADSL speeds have fallen well below 10Mbps, ADSL2+ and ADSL2 still provide worthwhile increases in connection speeds. There is very little difference in performance at distances above 4 km. To view an equivalent chart of downlink connection speed against line loss, please visit our article Chart of ADSL and ADSL2+ speed versus line loss. The table below provides the chart data in more granular form. Note that the length of the cables between your location and the BT exchange may be considerably more than the direct distance between your location and the exchange ‘as the crow flies’. This is because the cable first travels to a street cabinet, and there may be a number of possible routes. Our Increase Broadband Speed Guide provides top tips on how to increase your broadband speed by several megabits per second. Your WiFi could currently be the bottleneck of your broadband connection. Our WiFi Optimisation guide shows how to set up your WiFi connection to ensure you get the highest speeds possible. A filtered faceplate is often the cheapest way to substantially increase speeds at a cost of less than £10. Read our Filtered Faceplate page for more information.